A CAP Cessna 182 takes off on a mission. 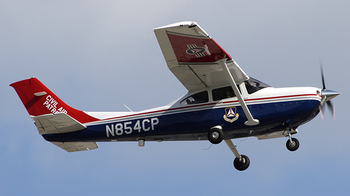 Civil Air Patrol surpassed 100,000 flying hours across its fleet of planes for the 2016 fiscal year late Tuesday – more than a 7 percent increase over the previous year. On the same date in Fiscal 2015, flying hours totaled 93,256. Why has CAP flown more this year? John Desmarais, director of national operations at National Headquarters at Maxwell Air Force Base, Alabama, attributed the increase primarily to disaster relief missions and the training to support it, though most CAP flying missions have increased this year. Disaster relief flights have totaled 850 more hours this year than last, Desmarais said. He cited 46 such missions across the country, ranging from massive flooding in South Carolina at the start of the fiscal year to support for the response to Hurricane Hermine in Florida over the last week. CAP aircrews have also flown more than 1,000 additional hours this year in training for emergency missions, Desmarais said. “CAP is always looking for new opportunities for its members to fly in support of their communities across the country, while continuing to prepare for and respond to emergencies when needed,” he said. “We don’t often know where the next disaster will be, but CAP works to be prepared all the time,” he added.